In the early hours of July 21, 1969, Neil Armstrong spoke the most famous eleven words in history when he became the first man to set foot on the moon. “That’s one small step for [a] man, one giant leap for mankind” was a succinct summary of Apollo 11’s extraordinary feat and, according to Armstrong, the result of four days of spaceflight and a few hours in the Lunar Module. The achievement those words marked was the culmination of thousands of years of observation and decades of hard science, not to mention countless centuries of artistic speculation through poetry, song, science fiction and fantasy. It’s hard to view the lunar landing as anything less than the apex of human achievement, the crowning glory of an ancient fascination, a preoccupation so primal it lies at the base of human consciousness. In those terms, the first giant leap for mankind was, in a sense, not walking on the moon, but noticing it in the first place. It isn’t hard for us to notice, of course. In the modern world, the moon is ubiquitous, even when it isn’t in the sky. It looms out at us from advertising hoardings, is sung and spoken of with great affection in every language on earth, has cameo appearances in films and on television and its progress and daily movements are endlessly followed – as if the moon was a star – by daily newspaper columns around the world. It makes its way, several times a day, into every nook and crevice of our life; it is almost as if the unseen hand of the Moon Marketing Board is at work to fill our lives with lunacy. Maybe that’s why we all feel that we have a passing familiarity with the moon and its appearance, in the same way that we say hello to newsreaders we spot in the wild from time to time, even though they haven’t the faintest idea who we are. As with our brief moment of familiarity with a journalist from the telly, there’s much we don’t see behind the public face of the moon. I’ve no idea how much Krishnan Guru-Murthy is hiding from us, but with the moon it’s around 41% and the reason for the observational deficit is tidal locking. It’s well known that the moon causes the tides on earth, by dragging a bulge of sea water around in its gravitational wake, but the earth also has a tidal effect on the moon. Because there are no oceans to pull, the earth tugs only at the moon’s crust and that tidal pull has locked the moon’s rotation to its orbit around the earth. As a consequence, the moon always presents the same face – the near side – to us and we see precious little of the far side. 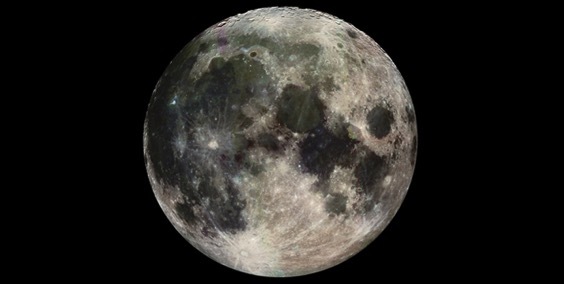 The limited views we have of the edges of the far side are caused by eccentricities in the moon’s orbit and axis which, with a sprinkling of parallax, add up to an apparent wobble that astronomers call libration; over time, an observer on earth sees around 59% of the moon’s surface. The two sides of the moon are as different in appearance as the opposite faces of a chocolate Hob-Nob. The side that we see, with its pattern of blotches suggestive of the man in the moon, a rabbit, a dragon, somebody carrying sticks or whatever else your cultural conditioning dictates, differs wildly from the b-side – an evenly pock-marked disc that looks like a cartoon planet from a children’s television programme. There are no large dark blotches on the far side and science awaits a fully convincing explanation why that may be. On the near side, the blotches were once thought to be expanses of water and were consequently named as maria, the plural of mare, the Latin for sea, by early astronomers, while the areas of the moon that appear brighter are the highlands or terrae, from the Latin for earth. Seventeenth century science was so convinced that the blotches were sea, they graded them by size and labelled them accordingly as bays, lakes and, the largest, an ocean. There’s a whole nautical almanac of names for things on the moon and hardly a drop of water in any of them. We now know that the maria are not oceans, but basalt plains formed from the flood lavas of ancient volcanic eruptions. The volcanic activity that formed the maria may have been a long time ago – around 3 billion years – but it is still more recent than the formation of the lunar highlands. The face of the moon, like those of humans, can be aged by appearance; in the case of the moon, the more craters a surface has, the older it is, but how old is the moon? The moon is almost as old as the earth or the earth is almost as old as the moon, depending on your perspective and where you think the story begins. For stories about the moon, we can eschew the traditional ‘once upon a time’ and start the story in the solar nebula – the spinning protoplanetary disc of dust, gas and rock from which planets begin to coalesce. The first moments of a planet formed in a swirling cloud of dust, rocks, asteroids and planetesimals, is as precarious as it sounds and, indeed, the earth was perhaps only as young as 23 million years old – a mere moment in geological time – when it is believed that it was hit by a planet the size of Mars. That hypothetical planet – named Theia by scientists – came off worse in the impact. Smashed into countless pieces, it lost most of its iron core to the earth but then formed an orbiting ring of dust and rock which gradually reassembled what remained of itself from millions of fragments and began to orbit the earth as the moon. And they all lived happily ever after, but please see footnote 1 for further clarification on this. The next time you catch yourself idly gazing at the moon, do consider the possibility that the moment isn’t in the least bit romantic or wistful and that you are neither nostalgic, plaintive or forlorn. Depending on your emotional peccadilloes, you might find a long, cold stare at the moon, while not being in possession of a poorly-expressed yearning for something or other, rather difficult – all of which brings us to the question of why that might be so. Why might a large rock in the sky inspire longing and a reflective mood (The moon is not really that reflective at all. It may be 100,000 times as bright as the brightest night-time star, but its surface is approximately as reflective as asphalt. If you put a car park in space, it would shine as much light back as the moon.)? The answer, of course, lies in the layers of meaning we have imbued the moon with over the thousands of years we have been looking at it. As our closest neighbour in space and the most obvious thing in the night sky, it’s perhaps not much of a surprise that the moon has loomed large in our lives for millennia. Indeed, our fascination with our constant companion has blessed the moon with more-or-less equal billing to the sun in mythology, in folklore and nature worship – a cooler, reflective, evening analogue to Sol, a yin to the yang of the sun. It’s an enduring theme, recycled in one form or another across many cultures. Classical Greek mythology had a number of pairings of god and goddess to represent the sun and moon. Brother and sister Apollo and Artemis were god and goddess of, respectively, the sun and moon, as were Phoebus and Phoebe, Helios and Selene and their later Roman counterparts. The Aztecs and Mayans had similar, though largely unpronounceable, arrangements while there are an equal number of moon gods with associated sun goddesses – even though the dominance of Mediterranean myth in Western culture rather blinds us to the fact. There’s a modern pantheon also; the neopagan and wiccan traditions now practised quietly in groves and on windy hill tops are reconstructed interpretations of what their advocates imagine to be the indigenous ancient religion of Britain and northern Europe. Their principal deities are the Horned God, who is venerated in many forms including the sun and the Triple Goddess, whose aspects include the moon and who I once spent a merry evening in the company of in a Westcountry field.